Do you need to train for your bike tour? That’s a question that only you can answer, but we created a helpful PDF guide to help you get started on planning! If a medical emergency occurs during your bike trip, the first action should always be to call 911. Following that, you will contact your Noble Invention team on the dedicated trail support phone number. You can also consult your Trip Handbook to identify your nearest town and/or medical center. Do you need to train for your bike trip? 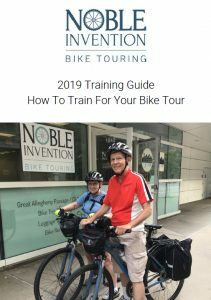 That’s a question that only you can answer, but here is some guidance to help you get the most from your bike tour and make sure you’re prepared to have a great time.